For the third time, the library at Webster Vienna coordinated a study week program during the busiest time of the semester. The library kept its doors open late, provided an encouraging environment topped with quotes from alumni, and hosted dogs coordinated by Student Government Association to let students alleviate the stress from final exams. 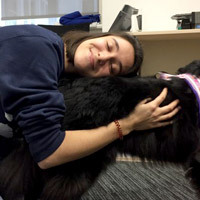 This term's guests were Vivienne and Chi, two well-trained Australian Shepherds accompanied by Gabi Glaser, who helped students forget about exams and papers for an hour and put a smile on everyone’s face. See more photos at Webster Vienna and in these Facebook and Flickr galleries about this year's event. Also, find more about the services for students in last year's story.